Hello crafters! 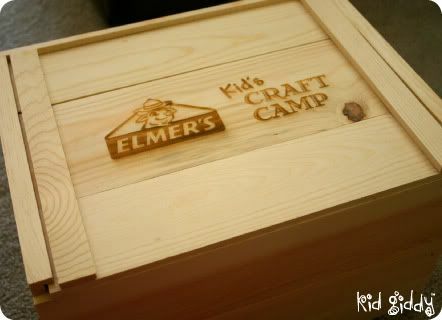 I was contacted by Elmer's a couple of months back, to see if I would be interested in receiving a Kid's Summer Camp kit with tons of their products to make something with and blog about. I'm not a review blog and will not go into the "reviews" of each product they sent me, but I will instead share with you what you'll need, to make your own Laptop Greeting Card. And if you are the one lucky reader (that leaves a comment below) - you just might be the one to win a fun package of your own. MAC's have an apple...but I have a flower on my laptop! (Which doubles as the bird's eye)...I love happy accidents! 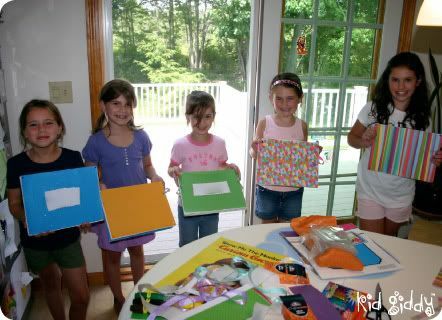 I'm happy to say, I finally got my girls and some of their friends together for an awesome craft session! 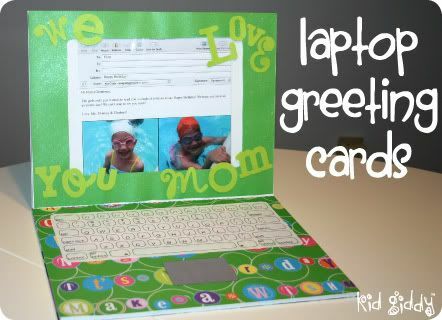 I have been waiting weeks to share this Laptop Greeting Card idea with you all! The girls were so excited to crank the tunes and get to work, and I think the only thing I needed was more space! It all started off with this awesome crate...I think my husband is jealous and I'm worried about leaving it alone for any extended period of time, as it may go missing and I may never get it back. 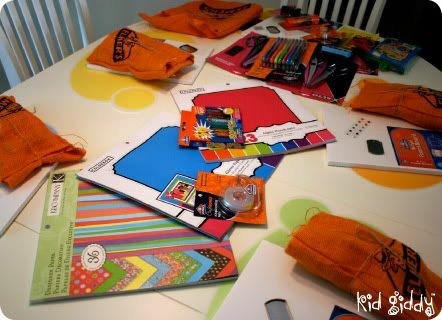 Here's what the girls saw before the crafting madness started...A whole slew of goodies and bright colors! They too loved the burlap baggies, and were equally excited to be able to keep it and bring it home! 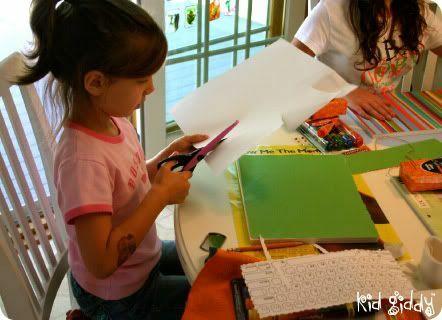 Here's one of my daughter's (Elephant), using a pair of Elmer's scissors for a fun edge effect! 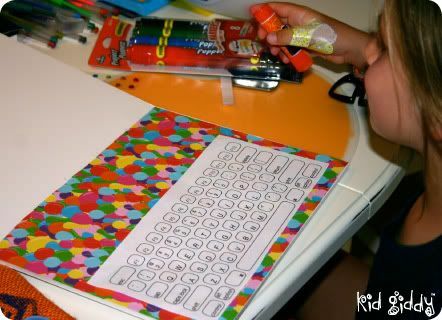 Ladybug colored in her keyboard with heavy duty permanant markers! 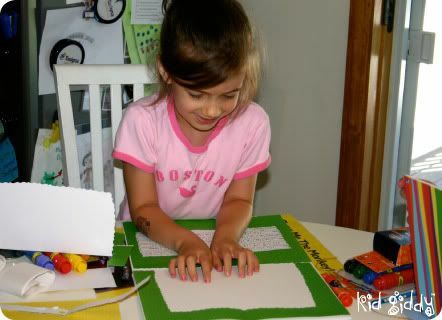 Elephant begins to find the joy of her Elmer's Foam Core board creation and looks deep into the "laptop screen" allowing her imagination to run free! My older daughter (Monkey) is finishing up the coloring in process on her last few key's, with her dual end permanent marker set. These dual end markers were a definite hit! Mittens finished placing her gems and laptop "skins" by using the glue dots from her kit. The glue dots were my favorite! 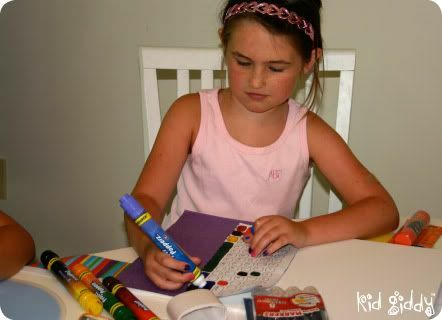 She also colored in some of her keys with the Gel pens! With just a hint of glitter they were a hit also! 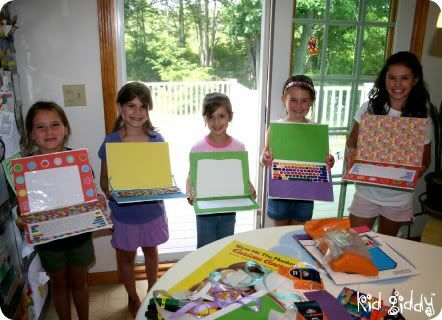 The girls show off the covers of their new Laptops! (I think they don't want to give them away anymore...but instead want to use them for pretend play) - Who wouldn't want to have one to play with - right?! Here they all are opened and ready for a special message and maybe a few pictures from home! So here's what you'll need for your Laptop Greeting Cards - or even just to make a laptop to play with and learn where all the keys are on the keyboard! 3 - Elmer's Craft Bond Extra strength glue sticks (these are blue and dry clear!) These worked best for gluing the keyboard to the inside of the laptop. 4 - Elmer's Double Sided Tape dispenser (we picked this up with our gift card and i LOVED it! It was gone before the crafting session was over!) 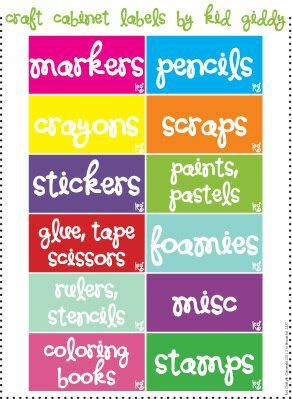 This double sided tape was the best for getting the thicker glitter scrapbook pages to stay down. We def needed more than one roll! 3 - Glitter Glue that puff's up when dried! 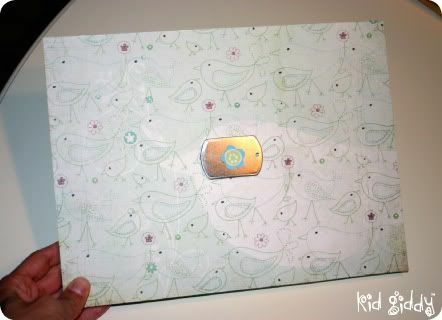 1 - Scrapbooking paper...on cell phones and iPads, they call it skins...pick out your favorite scrapbooking papers to cover your laptop inside and out! 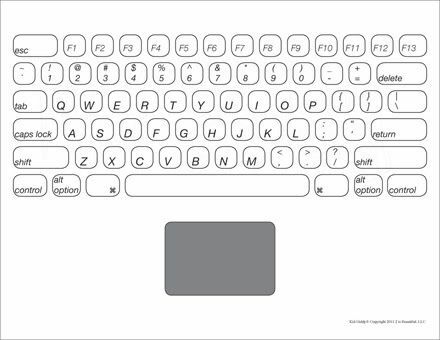 2 - Print out a copy of my Kid Giddy Keyboard for fun and learning! 3 - Dog Tags (if you want to use them as a mouse like my girls did - or if you want to put it on the front with a symbol like I did (see pic above)). 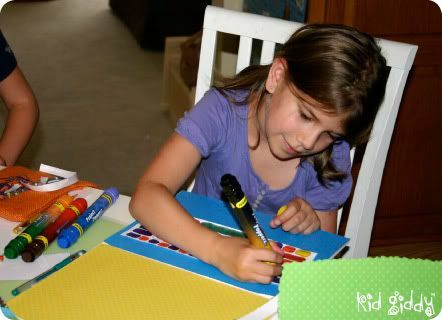 4 - Ribbon - If your child wants to use it like a real laptop, it will need to stay open...you can poke holes in the sides, about 3 inches from the fold, and 1/2" from the edge, using a screwdriver (on a rug or other soft surface). Put the ribbon through the inside of the hole, to the outside, and tie it in a double or triple knot to secure it. Then place the bottom of the same ribbon into the other hole from the inside, and tie knots on the outside also. Besure both sides are tied at an even length. 5 - Shower Curtain Liner - yep I said a shower curtain liner. Now for this project I used a brand new one! But for yours - you can get the one in your shower - replace it and use the very top of it and toss the bottom! The top is always clean as new and can totally be reused! I used the clear shower curtain liner for the "screen" part of the laptop and if you leave the top open, you can slide new messages in or new pictures. Then the liner makes the screen look more real! 6 - Imagination - you don't need tons of it...but a little will go a long way! So here's the info about the giveaway....Your "Host" bag and the 2 "kid" bags will not be the exact same as the ones we received, but will have the same products. If you'd like a chance to win - please leave a sweet comment below. (PLEASE NOTE: Elmer's said the winners must be U.S. residents; & a gift card is not included in the prize pack). The winner will have to email me a ship to address and the product will be sent directly to you. Thanks for reading, commenting & entering....and good luck! 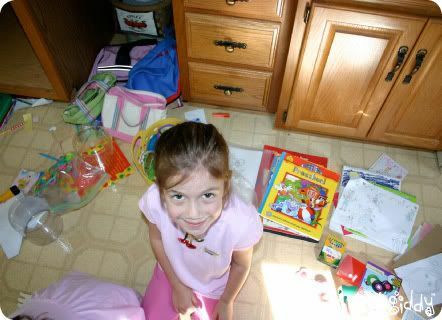 Comments must be posted by Saturday July 30, 2011 11:59EST to be counted. Winner will be announced Monday! Thank you! 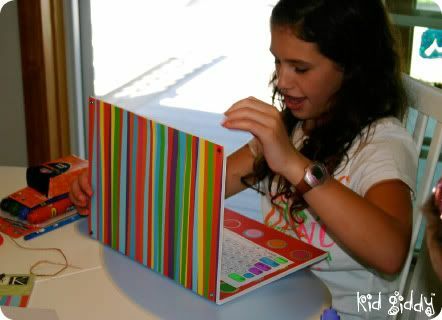 I hope you all enjoy making pretend laptops to play with or laptop greeting cards to send! 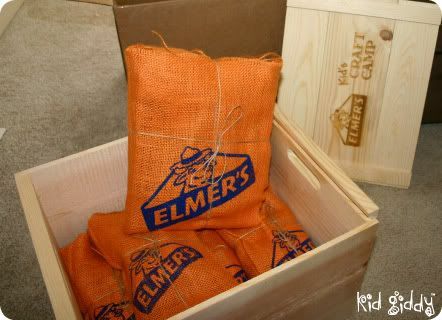 Thank you Elmer's for sending me fun in a box! The girls had such a blast! Have an awesome week! I will have more exciting tutorials to come in the next couple of weeks...so please stay tuned! 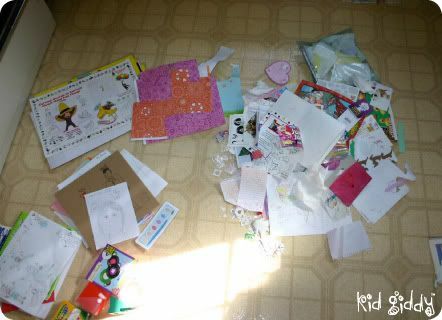 My little girls love to create just as much as I do. My oldest daughter has been drawing since she was only 14 months old on a Magna Doodle, no joke! 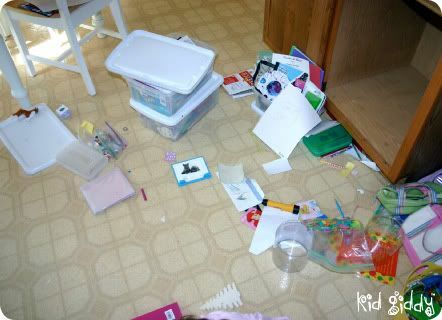 My youngest daughter caught wind of the fun and started, just around 2 years old. It's been non-stop creating ever since. 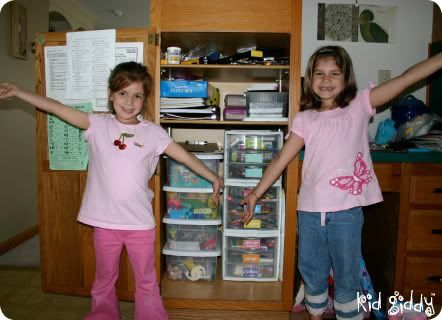 We learned early on that we needed a place where they could keep their coloring books and crayons, magna doodles, etc. A place they could easily get to, without getting into the wrong things or getting hurt! Enter in the creation of the "craft cabinet". Their "craft cabinet" has been a great source of inspiration and has always been filled to the brim. We have filled it, emptied it, cleaned it and reorganized it, over and over many times. Finally we came up with a much better system that has kept it cleaner more times than not. Everything has a place and everything must be in that place or there is weeping and frustration from all members of the family when something can't be found. Clean Sweep - take everything out first! Here's Elephant joining in the sorting process! I'm amazed at how much was eventually crammed in there! 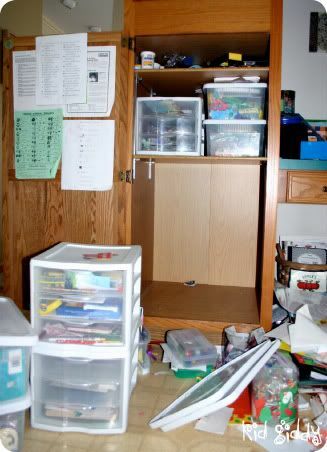 All of the drawers were removed and emptied. Then sorted by labels. Monkey & Elephant show off our amazing results! We had the 4 larger bins already, as well as the 3 drawer pieces, but adding the labels, changing the layout a little and moving up the middle shelf level, helped tremendously. Although these pictures were from October of last year, I'm happy to say - it still looks this good! 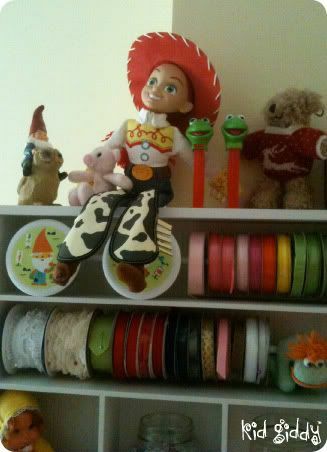 4) Felt, PomPoms, Pipe Cleaners, Foam stickers, etc. The bins are standard plastic containers and the 3 Drawer units are 8 1/2 x 11. I have since bought them a standard 12 x 12 Scrapbooking tote, since the scrapbooking pads don't fit into either the bins or drawers. 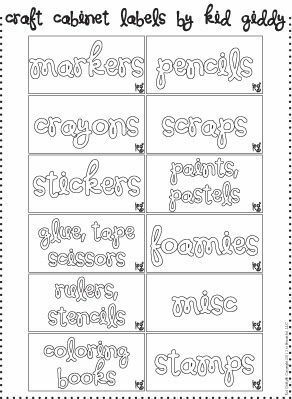 I'm sharing the labels I made for the drawers, in a color version and in a black and white version (if you'd like to color your own). 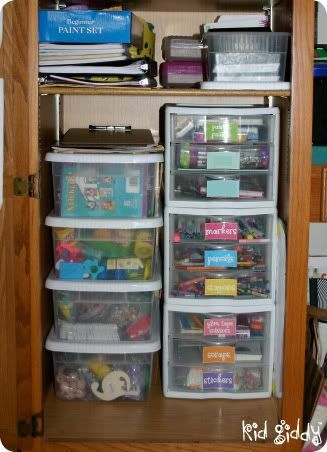 I used clear packing tape to "laminate" them and then stuck them to the inside of the drawers, where the handle of each drawer creates a curve. I only used 9, but I have added more so you can pick and choose which you need or prefer to use! Click on the image below to get to the Google Doc to download the PDF. I hope you enjoy them. Let me know if I'm missing a really important label and I'll add some more later. Have a great weekend! So I kind of don't want to post all these pictures lol!...but this room has evolved over the past year or two and will no longer be my craft room when we convert the space above our garage to our very real Studio space! Until then, I must be grateful for what I have and hope I won't be judged that it's all filled with buckets and bins of fabric and crafts! It's not as spacious as many other "craft spaces" I've seen in the blogging world, but it is sufficient for my needs for the next year. After that I will be busting at the seams - literally! I started off very simple and then started selling on Etsy, then designing patterns for Crafts n' things, and then working for Anna Griffin, and now with all the other projects in the works - it's all piling up - and I'm out growing my once perfect space! 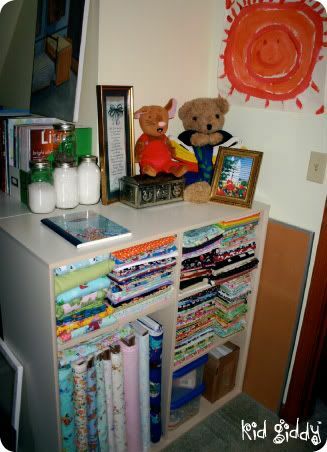 This is the Fabric stash that I dig from most frequently - My oldest daughter Monkey, painted the orange picture when she was in Kindergarten specifically for my craft room. That silver tin is from my mom when she was in Germany. I now have a Ribbon shelf rack on top of it...which is in the next two pics! The little girl doll, was featured in a previous post - she's my doll from when I was little. The jar of threads are all from the edges after washing my fabrics! I'm still trying to decide what to use them all for! Maybe doll hair! The green jars...I stocked up on them for the new Studio space! 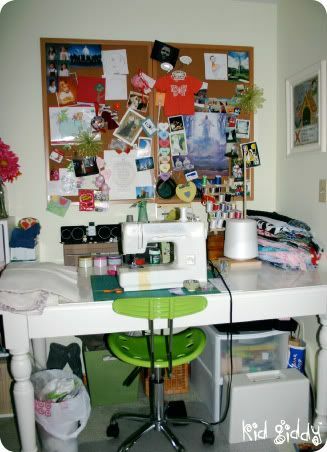 This is my pride and joy sewing table. It's the one from Pottery barn with the really REALLY awesome drawer inside (all the compartments are so handy)! It may not be ideal for the machine - but it works! My inspiration board hangs above - the butterfly t-shirt my mom made for me when I was little! My hubby got me an awesome chair in my most favorite color! 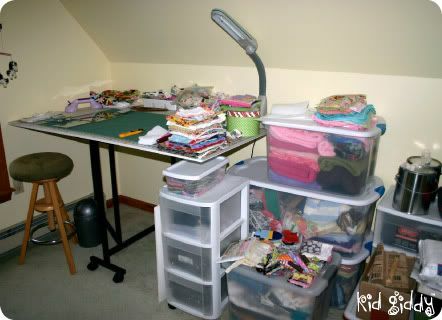 Here's my cutting table and off on the side...*blushes*...all my fabric stash that I don't use on a regular basis. 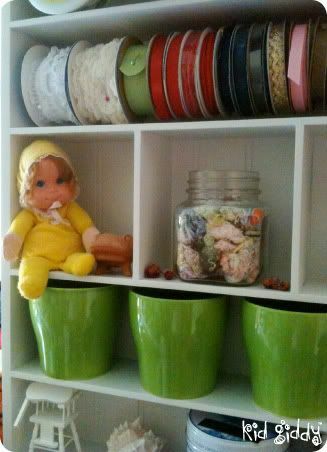 I also have projects that are waiting to be done in some of the front bins as well! The window is off to the left - great to look out and get lost in space (or better - in the garden)! These are all my books and magazines that have brought me much inspiration! The baskets are filled with fun things my daughters are allowed to do when they feel like hanging out with me instead of playing! They have their own fabric stashes and [plastic] needlepoint crafts! 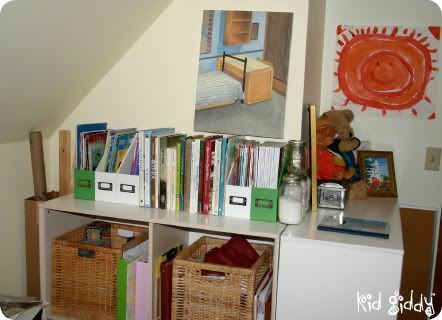 I hope you enjoyed a little peek into my creative space! 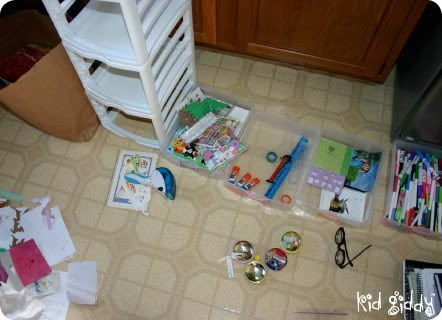 On friday - I will be sharing the "Craft Cabinet" that we have set up for our daughters everyday use! I'll have a freebie download available too! Busy Monday: Carter the Crab Softie - "Bits 'n Pieces by Kerry Goulder"
Get your copy while it's hot! 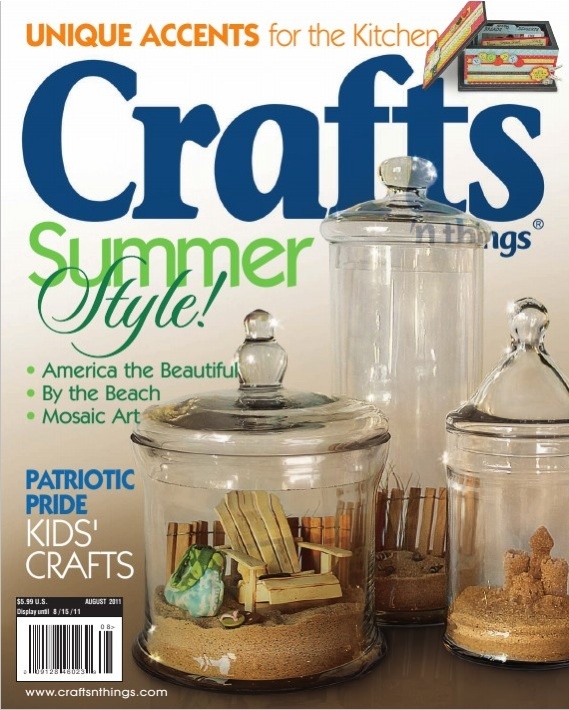 The latest issue (July/Aug 2011) of Crafts 'n things Magazine is a very special one this month! Not only is my sweet little Carter the Crab pattern available inside, but MY SISTER's awesome Terrarium tutorial is on the FRONT COVER!!! I was so excited for her and thought it was really fun for each of us to have a project in there at the same time! As the magazine mentioned - spending summer months with my daughter's finding hermit crabs in the Maine waters have been nothing short of fun, relaxing & awe inspiring! What they didn't have room to mention, was how I wish I could bring them back to my days as a young girl crabbing off the docks at my grandparents house (named "PrattsBottom") in Bozman, Maryland. During cold winter months, I long for summer. I have a life long love of of the beach and all things found there. I was told my grandmother made the best crab cakes - but I couldn't stand the smell or the taste - so I was content to disagree. Eventually my dad warned me that whatever I caught I had to eat (crabbing or fishing). So I got smart! I would wrap my chicken with string, sit on the dock, lower it in and wait for a crab to grab on. As soon as I had one on my line I'd pull him up slowly and carefully, get a really good long look at him, and then quickly shake him off before my dad could see that I had one! lol! They are just so beautiful to look at. Their coloring is exquisite! I greatly miss those days sitting on the dock in Bozman. A tiny little town, where the peace surrounds you. I made this little Carter the Crab with those memories in mind. Special memories from my youth. The great thing about these little crabs - they don't bite...and even better than that - I don't have to eat any of them! But they are fun to make, and fun to play with! 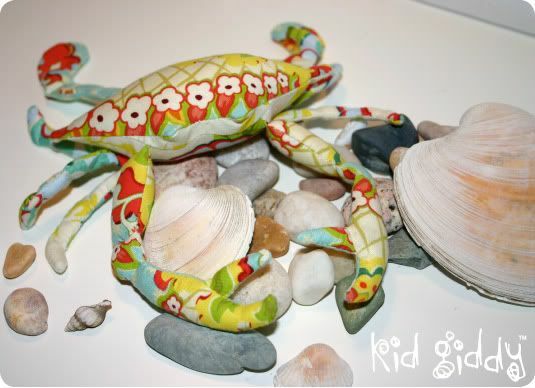 I hope you enjoy making your Carter the Crab softies with my original pattern! Please let me know if you have any questions putting yours together! Have an awesome day!